Debt stinks. We all know this. The sensible move here is to pay off any and all debts as soon as possible, right? Not so fast. In some cases, paying a debt off early doesn't save you all that much money. 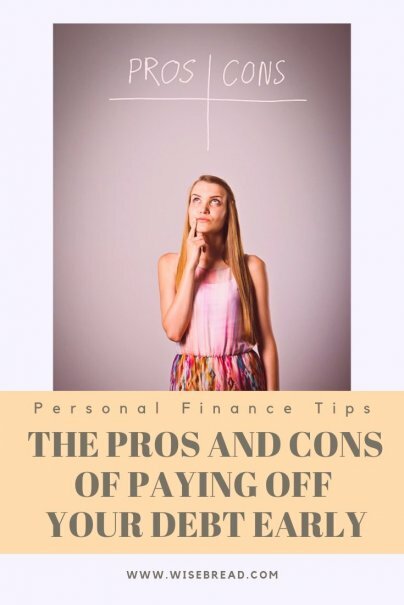 Let's take a look at the pros and cons of paying down debt before you have to. You can't take out a loan without paying interest. You also can't carry a credit card balance without paying interest. And the longer you owe money, the more interest you'll pay. Let’s say you buy a car for the price of $25,000, and you borrow $20,000 at an interest rate of 3 percent on a 60-month loan. That could mean more than $1,500 in interest payments over the course of five years. What a waste, right? Most loans have something called an "amortization schedule" that maps out how much you'll pay in interest and how much you'll pay in principal each month. With many loans — especially mortgages — you pay most of the interest in the early years and pay mostly principal later on. For example, let's say you have a 30-year loan of $300,000 with a 5 percent interest rate. Using this handy amortization calculator, this means you'll pay $1,610 per month. (For simplicity purposes, I am not including taxes and insurance in this calculation.) A typical amortization schedule shows that you will pay $1,250 per month in interest payments at first. But toward the end of the lending period, your interest payments are much lower. By the time you have three years left on the loan, you'll pay a little over $200 in interest per month and it will continue to decline from there. Your mortgage is $1,500 a month. Your car payment is $200 per month. Your student loan payment is $180. The minimum payment on your credit card balance is $250. If you're locked into these payments each month, you may not have a lot of money left over for other needs or wants. Debt prevents you from having true financial flexibility. Pay those debts off early, and breathe easier knowing you've freed up a significant amount of cash. Believe it or not, paying off debt early may actually hurt your credit. If you insist on always clearing debts in full long before they are due, you may cease to have enough credit history to get a favorable rating from credit agencies. As long as your debt burden is not too high, making consistent, regular payments on debts and paying bills on time is the best way to build strong credit.